As I wrote here, when Levi Goldsmith died on December 29, 1886, he was survived by his wife Henrietta and their eight children. Three of those children were already married, as we already saw. Their oldest child Eva had married Nathan Anathan in 1875, and they had two daughters, Helen (1879) and Bessie (1883) after losing their first two children, who died as babies. 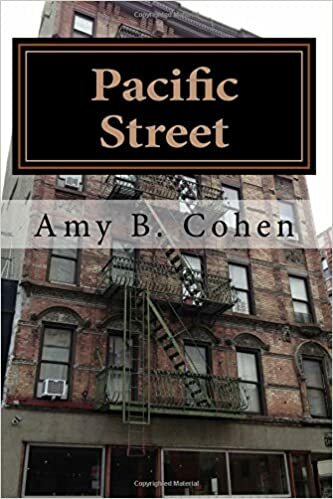 Thank you to Sherri Goldberg of Tracing the Tribe for pointing out that Nathan Anathan was a first cousin to Theresa Anathan, whose daughter Nellie Buxbaum was married to Philip Goldsmith, son of Jacob Goldsmith. Blanche and Max suffered two terrible losses in the early years of their marriage. Their first child, Ethel, was born in 1894 and died from pneumonia on December 29, 1898. 9 Their second child, Leah, named presumably for Levi, was born on January 19, 1895.10 I have not been able to locate a death record for Leah, but she is not listed with her family on the 1900 census or afterwards. Although Blanche reported on the 1900 census that she’d only had one child, on the 1910 census she reported that she had had four, only one of whom was still living. I have to believe that Leah died sometime between January 19, 1895, and 1900. Thus, the family of Levi Goldsmith suffered the deaths of two more very young children. 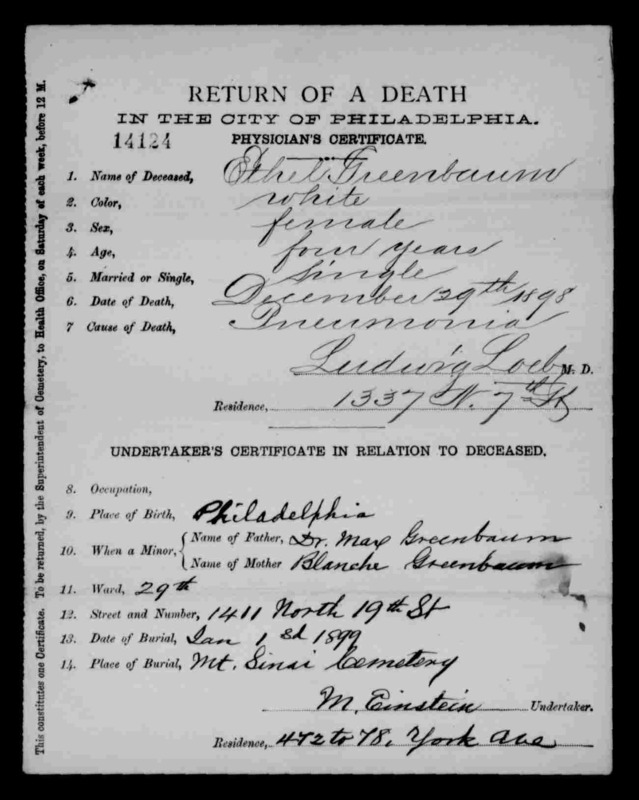 Pennsylvania, Philadelphia City Death Certificates, 1803-1915,” database with images, FamilySearch (https://familysearch.org/ark:/61903/3:1:S3HT-DTVH-TC?cc=1320976&wc=9F5N-RM9%3A1073210101 : 16 May 2014), 004009439 > image 1295 of 1741; Philadelphia City Archives and Historical Society of Pennsylvania, Philadelphia. The next sibling to marry was the youngest child of Levi and Henrietta, their son Sylvester. He married Ida Simms on March 21, 1895 in Allen County, Ohio.11 I could not find any definite records for Ida’s life prior to marrying Sylvester, but according to her death certificate,10 she was born in Michigan to John Simms and Sarah Mott on December 21, 1874. According to Sylvester’s obituary,12 she lived in Lima, Ohio, before marrying him. Three months after Sylvester’s marriage, his mother Henrietta Lebenbach Goldsmith died on July 3, 1895, in Philadelphia from “congestive apoplexy.” She was 60 years old and was survived by eight of the nine children to whom she had given birth. She was buried at Mt Sinai cemetery in Philadelphia where her husband Levi was buried. Pennsylvania, Philadelphia City Death Certificates, 1803-1915,” database with images, FamilySearch (https://familysearch.org/ark:/61903/1:1:JXRJ-MH6 : 8 March 2018), Henrietta Goldsmith, 03 Jul 1895; citing cn 371, Philadelphia City Archives and Historical Society of Pennsylvania, Philadelphia; FHL microfilm 1,862,809. Then three months after Henrietta’s death and six months after Sylvester married Ida, Ida gave birth to their first child, whom they named Henrietta. She was born in September 1895 in Lima, Ohio.13 She was not the only baby presumably named for Henrietta Lebenbach Goldsmith. Helen (Goldsmith) and Harry Loeb had a second child in January 1896 named Henriete Loeb,14 and on June 4, 1897, Felix and Bertha Goldsmith had a third child born in Norfolk, Virginia, whom they named Hortense Lee Goldsmith.15 In addition, Sylvester and Ida had a second child born on November 12, 1898, in Shelbyville, Indiana. They named him Louis Sylvester Goldsmith.16 Could he be yet another child named in memory of his grandfather Levi? Thus, by the end of the nineteenth century, both Levi Goldsmith and his wife Henrietta Lebenbach had passed away and were survived by their eight children and many grandchildren, many of whom were named for either Levi or Henrietta. Tragically, two more grandchildren died as babies, Blanche’s daughters Ethel and Leah. As of 1898, there were twelve surviving grandchildren: Eva’s two surviving daughters, Helen and Bessie Anathan; Estella’s three surviving sons, Jerome, Leonard, and Herbert Rothschild; Felix’s three children Frances, Lee, and Hortense Goldsmith; Helen’s two children, Armand and Henriete Loeb; and Sylvester’s two children, Henrietta and Louis. Levi and Henrietta must have been well-loved to have been so well-honored. The next decade would bring more births, but far too many tragic deaths. Armand Goldsmith Loeb, World War I draft registration, Registration State: Pennsylvania; Registration County: Philadelphia; Roll: 1907649; Draft Board: 29. Pennsylvania Historical and Museum Commission; Harrisburg, Pennsylvania; Pennsylvania Veterans Burial Cards, 1929-1990; Series Number: Series 2. This entry was posted in Genealogy, Goldschmidt/Goldsmith, Philadelphia, Virginia and tagged Anathan, Goldsmith, Greenbaum, Loeb, naming patterns, Philadelphia, Rothschild, Virginia by Amy. Bookmark the permalink. Dreadful for Blanche and Max to lose their children like that. I recognise the surname Löeb from Gemmingen in Deutschland. Lots of Loebs! And yes—and there were so many more losses to come for this family. Infant mortality was high over a hundred years ago and medical services,inadequate as they were in those years, were only available for the rich. Levi and Henrietta’s family were particularly hit hard with tragedies. Within the same time frame my grandparents had been more fortunate. Out of their sixteen children they lost only one due to childhood diseases. I admire your ability and enthusiasm to dig up all these facts about your family, Amy. Unfortunately, their sorrows do not end here. They were just beginning. Thanks, Peter! Yes, it was so common. And yet every time I read about a child dying, it feels raw and shocking again. I love knowing the story behind how babies are named. I always worry that there is a story I don’t know and that it will be lost forever. My youngest granddaughter has the middle name of Loraine which, as you know, was a very special person in my life. I hope she passes the story down to her descendants as to why she was given that name. I love that my 8 year old grandson likes to tell people that he was named for his great-grandfather Nat (my FIL). I think he will be the one to carry on the family history tradition! Lots of great genealogy here! Nice job! Do you know anything about the origins of the surname Anathan? Never heard it before. Out of curiosity, do the records you typically find tell you if a baby is full-term or not? I wondered that when I saw the baby born six months after the wedding. It’s possible that the baby was not full-term, but it would be kind of nice to have that info. No idea about the baby. No birth weight to give any clues. And I’d never heard of that surname either. I should check it out! I’d love to hear the answer if you find it! I will let you know—once my internet is back up and running, and I don’t have to use my phone!